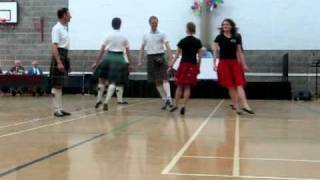 The characteristic formation of this dance called "Set to corner and cast away" in SCDDB terminology or often addressed as "Best set in the hall formation" sometimes also as "Peter White formation", has first been introduced by Alec Hay in 1976 in his dance Peter White in Strathspey time. 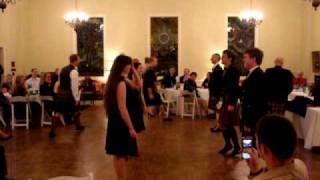 The formation next occurred in Ron Wallace's dance Aberdeen Hunt, another Strathspey. Seemingly, the formation experienced a lift-off after it had been included into this dance, Best Set in the Hall, in Jig time in 2003 by Helen Greenwood and published in RSCDS Book 46. 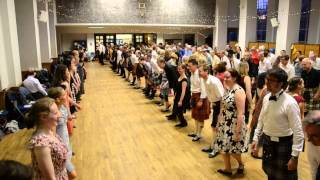 Now there are more the 20 dances of all types (Strathspeys, Jigs, Reels and even a Medley) featuring this formation. Added on: Aug. 19, 2012, 8:49 p.m.
Added on: July 3, 2015, 9:39 p.m.
FSCDC 16 December 2014 2014-12-16 Anselm Lingnau Dec. 21, 2014, 3:48 p.m.
Richmomd 13.02.19 2019-02-13 Simon Stewart Feb. 11, 2019, 12:53 p.m.
Watford & West Herts Scottish Society Improvers' and Beginners' Class - 28 January 2019 2019-01-21 Stuart Kreloff Jan. 29, 2019, 10:34 p.m.
Watford & West Herts Scottish Society Improvers' and Beginners' Class - 21 January 2019 2019-01-21 Stuart Kreloff Jan. 16, 2019, 10:20 p.m.
Budapest Local Club 05.10.2017 2017-10-03 Zoltán Gräff Oct. 3, 2017, 9:36 p.m.
Budapest Local Club 30.03.2017 2017-03-30 Zoltán Gräff March 31, 2017, 11:34 a.m.
JAVEASCD-23rdIG Valencia-SATURDAY 4th March 2017 2017-03-04 Roy Birkinshaw Jan. 10, 2017, 12:05 p.m.
chiswick club night 2015-10-25 Evelyn Norman Oct. 23, 2015, 5:12 p.m.
Budapest Local Club 26.03.2015 2015-03-26 Zoltán Gräff March 26, 2015, 9:33 p.m.
26th FEB 2015-02-26 Richard Dover Feb. 23, 2015, 4:19 p.m.
Budapest Local Club 08.11.2016 2016-11-08 Zoltán Gräff Nov. 8, 2016, 9:37 p.m.
HHK 2018.05.22 Keira Hartstein May 21, 2018, 5:12 a.m.
GASP - April 20 2018 - Bryan Gordon 2018-04-20 John Bottriell April 18, 2018, 1:08 a.m.
Budapest Local Club 26.03.2019 2019-03-26 Zsófia Varga March 28, 2019, 8:24 a.m.
140812 St Andrews Br. Social w4 2014-08-12 Martina Mueller-Franz June 19, 2014, 4:16 p.m.
SCD Nürnberg (2015-09-14) 2015-09-14 Roland Ritthaler May 28, 2016, 9:54 p.m.
26th FEB (Copy) 2015-02-26 Richard Dover Feb. 23, 2015, 4:20 p.m.
Lethbridge 2016/04 April Social 2016-04-27 Gail Michener Jan. 25, 2017, 12:45 a.m.
Budapest Local Club 05.01.2016 2016-01-05 Zoltán Gräff Jan. 19, 2016, 9:43 a.m.
Darmstadt_2018_09_10 2018-09-10 OnYourToes Darmstadt Sept. 9, 2018, 7:27 p.m.
170327 Nürnberg 2017-03-27 Annette Lotz July 23, 2017, 10:51 a.m.
JaveaSCD-2014-12-10 2014-12-10 Roy Birkinshaw Dec. 8, 2014, 11:16 a.m.
Konny 25.3.2017 Verl Girl March 21, 2017, 6:34 p.m.
Z SEHSCDS Class 190212 2019-02-12 Peter Dixon Feb. 8, 2019, 1:59 p.m.
ZA 2015-07-23 RSCDS Cape Town Taster Session demo 2015-07-23 Heather Hodgson July 21, 2015, 1:24 p.m.
Budapest Local Club 05.03.2013 2013-03-05 Zoltán Gräff March 5, 2013, 11:08 p.m.
Budapest Local Club 26.03.2013 2013-03-26 Zoltán Gräff March 27, 2013, 11:37 a.m.
140906 Farewell to 49 2014-09-06 Martina Mueller-Franz Aug. 25, 2014, 4:14 p.m.
Carole M Evans 2015-02-04 Roy Birkinshaw Feb. 1, 2015, 9:44 p.m.
SCD Nürnberg (2015-09-21) 2015-09-21 Roland Ritthaler May 28, 2016, 9:58 p.m.
SCD Nürnberg (2015-10-05) 2015-10-05 Roland Ritthaler May 28, 2016, 10:03 p.m.
San Diego 2015 Christmas Dance 2015-12-07 Ward Fleri Oct. 30, 2015, 12:08 p.m.
San Diego 20 Nov 2015 Dance Party 2015-11-20 Ward Fleri Nov. 2, 2015, 2:46 a.m.
NY Branch summer dancing June 23 2016 2016-06-23 Sue Ronald June 21, 2016, 6:05 p.m.
Newark weekly 2016-09-20 2016-09-20 John Aitken Jan. 4, 2019, 10:05 a.m.
Waltham weekly 2017-03-02 2017-03-02 John Aitken Feb. 25, 2017, 3:27 p.m.
Budapest Special Practice 19.04.2017 2017-04-19 lldikó Szakolczai April 20, 2017, 3:59 p.m.
Oldenburg 2017-10-09 (Erikaweg) 2017-10-09 David Quarrie Oct. 10, 2017, 11:05 a.m.
MSA Advanced 09.11.17 2017-11-09 Nameless Dancer Nov. 3, 2017, 11:18 p.m.
Hamburg Class 2018-02-01 2018-02-03 Dieter Lange April 28, 2018, 12:41 p.m.
Budapest Local Club 25.09.2018 2018-09-25 Zoltán Gräff Sept. 25, 2018, 11:27 a.m.
NZ Summer School 4 Jan 2019-01-04 Ian Russell Dec. 19, 2018, 2:33 a.m.
Waltham weekly 2019-01-10 2019-01-10 John Aitken Jan. 4, 2019, 10:07 a.m.
Hamburg Class 2019-01-10 2019-01-11 Dieter Lange Jan. 17, 2019, 5:45 p.m.
Abingdon Class 21 January 2019 2019-01-21 Sandra McLevy Jan. 22, 2019, 12:18 a.m.
ADW 5.4.19 Elizabeth Gull April 3, 2019, 9:45 a.m.
Budapest Local Club 13.02.2014 2014-02-13 Zoltán Gräff Feb. 13, 2014, 9:51 p.m.
President's Night Helsby & District Caledonian Society Friday 22nd April 2016 2016-04-22 Andrew Locke March 8, 2016, 3:41 p.m.
2018-10-25 / Brussels Dance Scottish - weekly class 2018-10-25 Jette Rossen Nov. 7, 2018, 9:19 p.m.
Waltham Class 12th October 2017-10-12 JOSEPHINE THORPE Oct. 11, 2017, 11:30 a.m.
Budapest Local Club 14.03.2013 2013-03-14 Zoltán Gräff March 18, 2013, 10:24 a.m.
Joint 2018-03-24 Camberley & Bracknell Spring Dance 2018-03-24 David McQuillan Dec. 30, 2017, 5:29 p.m. 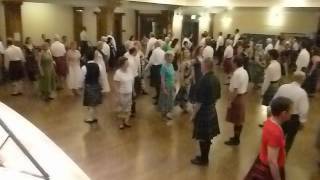 The Sunday Class in Tynemouth 21st September 2018 2018-09-21 Amanda Peart July 21, 2018, 6:49 p.m.
Bielefeld Dance - o6. o7. 2017 Verl Girl June 7, 2017, 7:10 p.m.
ZA 2017-12-11 Fish Hoek End-of-year Party 2017-12-11 Heather Hodgson Dec. 7, 2017, 12:51 p.m.
2019-02-25 Nürnberg 2019-02-25 Annette Lotz March 1, 2019, 10:04 p.m.
Abingdon 4 December 2017 2017-12-04 Sandra McLevy Dec. 3, 2017, 5:14 p.m.
Budapest Local Club 25.01.2018 2018-01-25 Zoltán Gräff Jan. 25, 2018, 9:34 p.m.
Oldenburg 2017-06-19 2017-06-19 Martin McWilliam June 17, 2017, 8:53 p.m.
Budapest Local Club 06.05.2014 2014-05-06 Zoltán Gräff May 6, 2014, 10:09 p.m.
Hayes ~ 151120 Dance 2015-11-20 James Wilson Nov. 20, 2015, 10:50 a.m.
Budapest Local Club 11.12.2018 2018-12-11 lldikó Szakolczai Dec. 12, 2018, 7:58 a.m.
Budapest Local Club 23.04.2013 2013-04-23 Zoltán Gräff April 23, 2013, 10:26 p.m.
JaveaSCD-2014-11-12 2014-11-05 Roy Birkinshaw Nov. 9, 2014, 11:17 a.m.
Budapest Local Club 20.10.2016 2016-10-20 Zoltán Gräff Nov. 6, 2016, 11:34 a.m.
Oldenburg 2016-08-29 2016-08-29 David Quarrie Sept. 16, 2016, 6:03 p.m.
Party Dance List 2019-06-01 Andrew Osborne March 24, 2019, 6:49 p.m.
RSCDS Book 46 2015-09-20 Angelika Schmidkonz Sept. 20, 2015, 8:35 p.m.
Duddingston 30 Nov 17 2017-11-30 John Watkins Nov. 26, 2017, 9:53 a.m.
Bielefeld 2013 Verl Girl May 9, 2013, 11:33 p.m.
Ritas Night 16th Nov 2017 at BRC 2017-11-16 Roy Birkinshaw Nov. 15, 2017, 6:22 p.m.
Duddingston 16 Nov 17 2017-11-16 John Watkins Nov. 11, 2017, 9:58 p.m.
Duddingston 02 Nov 17 2017-11-02 John Watkins Oct. 29, 2017, 11:05 a.m.
Saint-Petersburg classes with Catherine Livsey - Social Dancing 2017-02-25 Ekaterina Iarmarkina Jan. 31, 2017, 8:48 a.m.
Budapest Local Club 24.03.2016 2016-03-24 Zoltán Gräff March 25, 2016, 10:06 a.m.
Budapest Local Club 04.04.2013 2013-04-04 Zoltán Gräff April 4, 2013, 11:27 p.m.
GASP - May 3 2019 - Katie Shaw 2019-05-03 John Bottriell March 10, 2019, 11:23 p.m.
ZA 2012-08-27 Fish Hoek Dance Class 2012-08-27 Heather Hodgson April 2, 2017, 11:47 a.m.
Duddingston 02 March 2017 2017-03-02 John Watkins Feb. 26, 2017, 10:07 a.m.
2014 TAC SS 3-Tuesday Chris Ronald June 29, 2014, 3:56 p.m.
Budapest Local Club 29.09.2016 2016-09-29 Zoltán Gräff Sept. 30, 2016, 10:26 a.m.
Blairgowrie July 2017-07-07 Kate Kinnear June 29, 2017, 2:20 p.m.
Westchester May 21st 2014 2014-05-21 Sue Ronald May 19, 2014, 5:40 p.m.
GASP - January 12 2018 - Katie Shaw 2018-01-12 John Bottriell Nov. 22, 2017, 1:40 a.m.
Chiswick ~ 170122 Social Dance 2017-01-22 James Wilson Jan. 17, 2017, 9:49 p.m.
Sue's 5 suggestions for 2019-2020 2019-02-17 Sue Ronald Feb. 13, 2019, 12:55 a.m.
RSCDS Edinburgh Joint Lothian's Dance 2017 2017-04-01 RSCDS Edinburgh Feb. 7, 2017, 9:04 p.m.
Queensferry Lifeboat SCD 2017-02-17 Bill O'Donnell Feb. 14, 2017, 9:07 p.m.
Salem Class Party 2015-05-09 2015-05-09 Charles Liu Jan. 30, 2018, 6:02 p.m.
Stirling 90th Anniversary 2017-09-29 Kate Kinnear Sept. 23, 2017, 7:30 p.m.
Budapest Local Club 24.01.2019 2019-01-24 Zoltán Gräff Jan. 24, 2019, 1:27 p.m.
Waltham Burns Night 2018 2018-01-22 John Aitken Jan. 8, 2018, 11:12 p.m.
Linlithgow SCDC 23 Nov 2018 2018-11-23 John Watkins Nov. 20, 2018, 1:40 p.m.
Westchester 092618 2018-09-26 Ken Saunders Sept. 22, 2018, 2:02 p.m.
Hayes and district summer social program 2016-06-17 Matthew Goulden June 16, 2016, 8:48 p.m.
ZA 2019-03-27 Lynfrae Dance Class Heather Hodgson March 28, 2019, 1:51 p.m.
Surbiton 2016 June 30th - End of Season Party 2016-06-30 Jenny Kendrick Nov. 17, 2017, 1:30 a.m.
Surbiton 2017 May 18th - AGM and dancing 2017-05-18 Jenny Kendrick May 12, 2017, 1:48 p.m.
ZA 2019-04-29 Fish Hoek Dance for All Class 2019-04-29 Heather Hodgson April 22, 2019, 10:56 a.m.
Rhein-Main-Mini-Social, 5. September 2017 (F) 2017-09-05 Anselm Lingnau Aug. 5, 2017, 11:08 p.m.
FSCDC 22 August 2017 2017-08-22 Anselm Lingnau Sept. 20, 2017, 12:59 a.m.
Summer Tuesdays 2018_07_31 2018-07-31 Graham Hamilton June 8, 2018, 9:04 p.m.
Surbiton 31 May 2018-05-31 Cathy Daldy May 25, 2018, 4:34 p.m.
ZA 2018-09-06 RSCDS Pretoria Spring Social 2018-09-06 Heather Hodgson Sept. 3, 2018, 4:02 p.m.
Duddingston Christmas Party 2017 2017-12-07 John Watkins Nov. 23, 2017, 9:37 a.m.
LeedsScottish Dance Club 25 February 2017 2014-09-20 Irene Dracup Jan. 2, 2017, 9:44 p.m.
ZA 2019-01-21 Fish Hoek Dance Class 2019-01-21 Heather Hodgson Jan. 23, 2019, 12:37 p.m.
St Columba's Dancers 190225 2019-02-25 Sarah B. Dec. 21, 2018, 9:27 p.m.
Abbeyview Christmas Party - 11 Dec 18 2018-12-11 Bill Austin Nov. 7, 2018, 10 p.m.
Oslo SCD Group Summer Dance 2018 2018-06-11 James Gray June 3, 2018, 4:18 p.m.
ZA 2018-06-25 Another Noughty Night out on the Dance Floor 2018-06-25 Heather Hodgson June 11, 2018, 12:12 p.m.
RSCDS BHS 2016-12-28 Christmas Dance 2016-12-28 David McQuillan Nov. 17, 2016, 5:06 p.m. Ski 'n' do 2016 Saturday 2016-02-20 James Gray Feb. 8, 2016, 11:22 p.m.
RSCDS BHS 2014-10-11 Autumn Social 2014-10-11 David McQuillan Aug. 20, 2015, 8:25 p.m.
Stirling with James Coutts 2017-09-02 Kate Kinnear July 17, 2017, 10:41 p.m.
Moose Jaw SCD Workshop Ball 2018 2018-09-29 Gail Michener Sept. 20, 2018, 12:15 a.m.
2018-10-13 Trinity SCDC 2018-10-13 John Nuttall Oct. 8, 2018, 2:17 p.m.
150811 w3 - St Andrews Br. Summer Dance 2015-08-11 Martina Mueller-Franz May 18, 2015, 3:22 p.m.
ZA 2019-01-28 Fish Hoek Burns Nicht Dance Class 2019-01-28 Heather Hodgson Jan. 28, 2019, 3:41 p.m.
Münster Christmas Ball 2007 2007-12-22 Edwin Werner Sept. 30, 2016, 10:16 a.m.
ZA 2018-12-17 Fish Hoek's End-of-year party 2018-12-17 Heather Hodgson Dec. 10, 2018, 1:02 p.m.
Adendorf Nameless Dancer Feb. 27, 2019, 10:58 a.m.
Grenoble SCD - Saturday Ball 2018-06-16 Kevin PIQUEMAL April 22, 2018, 11:23 a.m.
ZA 2016-07-18 Mandela Day Dance 2016-07-18 Heather Hodgson June 20, 2016, 11:53 a.m.
Castle Club with Nicol McLaren 180303 2018-03-03 Kate Kinnear Jan. 4, 2018, 2:03 p.m.
Dunfermline Picnic charity dance 27June18 2018-06-27 John McLean June 9, 2018, 8:49 p.m.
Leeds Branch and Leeds Club joint Christmas Dance 2017 2017-12-16 Catherine Livsey Aug. 15, 2017, 4:12 p.m.
2018 Bluebell New Year Party 2018-01-13 Nameless Dancer Jan. 7, 2018, 12:47 a.m.
Budapest 2013 Ball – 27 April 2013-04-27 Anselm Lingnau Jan. 9, 2013, 1:55 a.m.
Vienna 2014 Sunday Ball Lena Hamelbeck-Galle March 23, 2014, 10:14 a.m.
Kirkcaldy Branch Winter Dance (Pathhead Church Hall) 2016-11-18 Bill O'Donnell Nov. 17, 2016, 3:22 p.m.
15 05 09 Norwich RSCDS 2015-05-09 Chris Pratt Feb. 27, 2015, 8:01 p.m.
ZA 2017-10-14 RSCDS Pretoria 45th Anniversary Ball 2017-10-14 Heather Hodgson Sept. 10, 2017, 9:53 p.m.
Jeremy Dent · March 7, 2016, 9:02 a.m.
...of lilting tune, the Set To and Cast movement and the final chase and turn. Top dance!